Metro.OTDR-F7 is a high performance OTDR for installing and troubleshoot optical infrastructures and FTTx network. It can measure physical characteristics such as length, transmission loss and splice loss. It can also locate the faults or breaks of optical fiber. 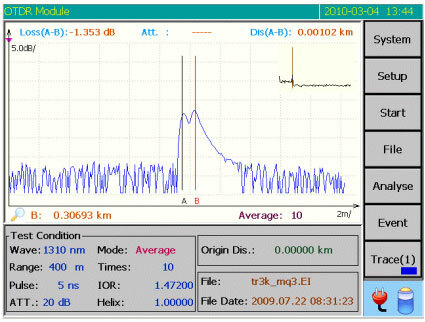 Metro.OTDR-F7 is an excellent tool for the deployment and maintenance of the optical plant that must be reliable for high-speed transmission. Most of the tests are tailored for each type of fiber that users may execute easily and the save the curves ready to be transferred for further analysis of FTTH/PON, Medium and Ultra long-haul fiber plants. Metro.OTDR-F7 is a high end solution widely used in engineering construction, maintenance test, optical fiber troubleshooting, manufacturing and installation of optical fiber and cables. Manual mode: real-time or average depending if users want to see dynamic changes or prefer to suppress noise while SNR is improved. Auto mode: measurement is set automatically then engineers may know about the fiber conditions very quickly. 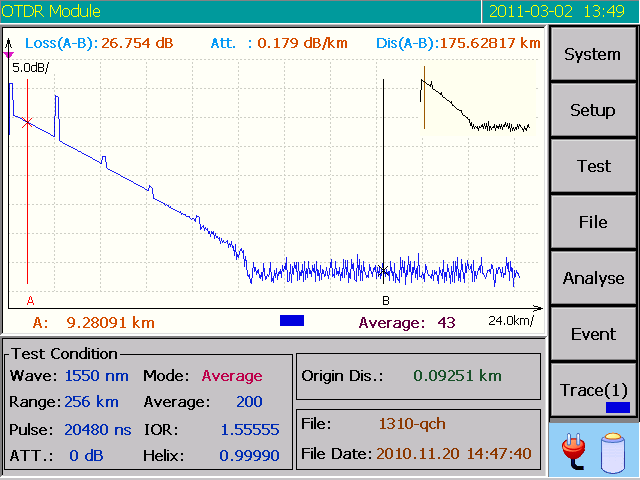 Dead-zone mode: suitable for testing optical fiber at short distances parameters are programmed automatically. AT.OTF7.HHA Metro.OTDR.F7 model A. Albedo Metro.OTDR.F7 high performance OTDR for fiber testing. Including 1310 /1550nm and dynamic range of 37/35dB. Interfaces FC/UPC, 6,5" color touch screen,battery operated, power adapter and rugged transport case. 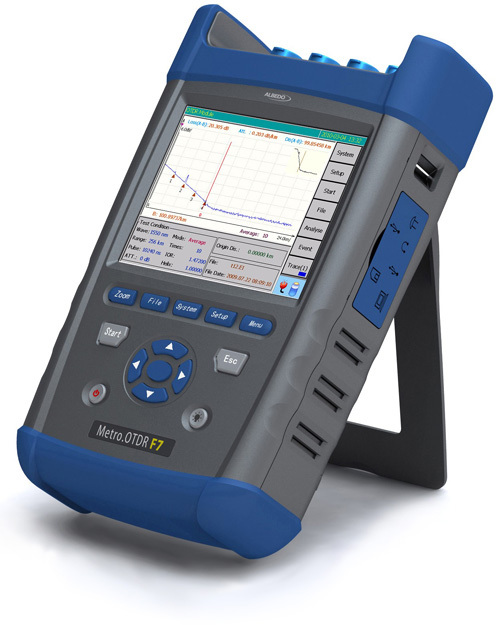 AT.OTF7.HHB Metro.OTDR.F7 model B. Albedo Metro.OTDR.F7 high performance OTDR for fiber testing. Including 1310 /1550nm and dynamic range of 42/40dB. Interfaces FC/UPC, 6,5" color touch screen,battery operated, power adapter and rugged transport case. AT.OTF7.HHC Metro.OTDR.F7 model C. Albedo Metro.OTDR.F7 high performance OTDR for fiber testing. Including 1310 /1550nm and dynamic range of 45/43dB. Interfaces FC/UPC, 6,5" color touch screen,battery operated, power adapter and rugged transport case. 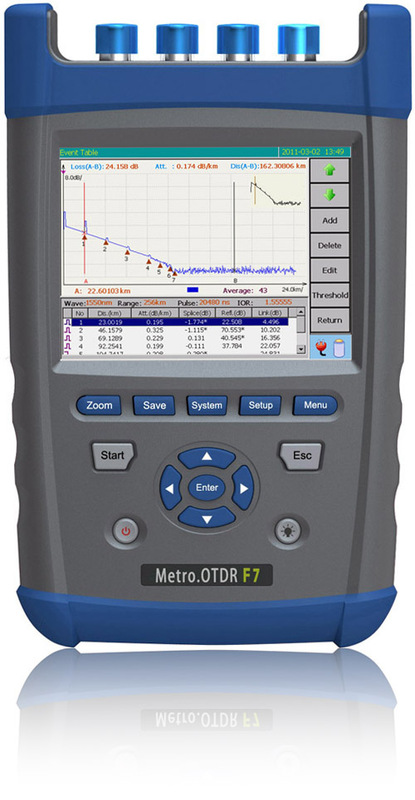 AT.OTF7.HHD Metro.OTDR.F7 model D. Albedo Metro.OTDR.F7 high performance OTDR for fiber testing. Including 1310 /1550/1625nm and dynamic range of 37/36/34dB. Interfaces FC/UPC, 6,5" color touch screen,battery operated, power adapter and rugged transport case.